After spending eight years in prison, a Bulawayo man returned home to find his wife impregnated by another man. That was the first of his shocks, then his wife went on to disown him because of his criminal past. This was heard in a case in which ex-convict Pritchard Ndlovu from Nkulumane was sued by his estranged wife Sitheni Sibanda for disturbing her peace and romantic relationship with her new lover Innocent Masuku. In his statement at the Bulawayo Civil Court, Ndlovu claimed he was surprised to find his wife with a third child upon his release from prison sometime in November last year. Ndlovu got arrested in 2008 for illegal possession of copper and sentenced to eight years in jail. Sibanda defended her infidelity saying it was out of desperation since there was no one to take care of her and their two children when Ndlovu was incarcerated. “While Pritchard Ndlovu was in prison I met and started a romantic relationship with Innocent Masuku even though I had not formally informed the respondent that I intended to terminate our customary union and start a relationship with someone else. “This was largely because the children and I were near destitutes as no one was looking after us since I was unemployed. As a result of my relationship with Masuku, a child Bonginkosi Zinhle was born,” she said. 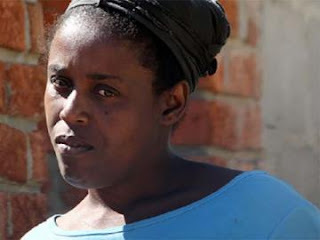 Sibanda said after the birth of the child she went to her in-laws and told them that she was no longer interested in their son but they refused to talk to her. “I had moved on with Masuku but Ndlovu after his release approached me several times wanting to salvage the relationship. I am no longer interested in him. “On 10 April he came to where I now stay with Masuku and chased after him with an axe. As a result of that incident, I am now living in fear and urgently need the court’s protection,” she said. In response Ndlovu said his actions were out of anger after his wife allegedly betrayed his trust when he was imprisoned. “When I went to her place of residence I was delivering food for the children. It was unfortunate that on the day in question I met Masuku and an altercation arose after I asked him why he impregnated my wife. When I took the axe my intention was not to strike him but to scare him off,” he said. In his ruling, presiding magistrate Sheunesu Matova ordered Ndlovu not to visit Sibanda at her place of residence or disturb her peace in any way.